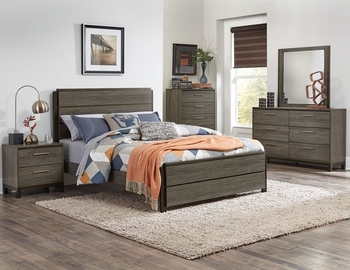 The contemporary styling of the Vestavia Collection provides a unique platform from which to redecorate your bedroom. 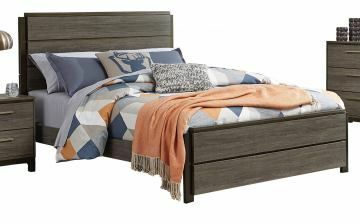 Faux wood printed veneer provides subtle texture and a grey finish as perfect contrast to the dark brown finish of the base rails of the case pieces and back panels of the headboard and footboard. Clean lines lend to the angular modern look and are enhanced by the horizontal brushed nickel hardware. Offered in both adult and youth beds, this collection provides great flexibility to your rooms at home.